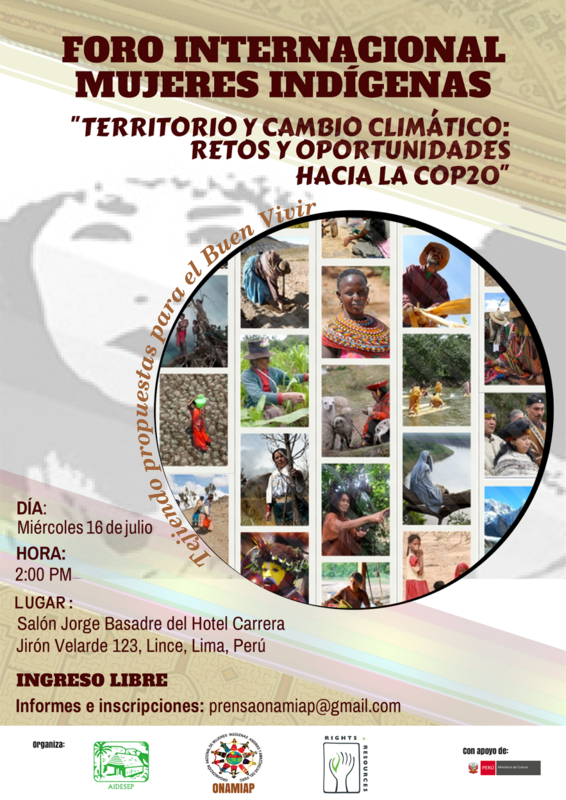 The National Organization of Indigenous Andean and Amazonian Women (ONAMIAP), Interethnic Development Association of the Peruvian Rainforest (AIDESEP) and Rights and Resources Initiative (RRI) will be hosting the International Indigenous Women’s Forum, Land and Climate Change: Challenges and Opportunities towards COP20, with technical support provided by CIFOR, on July 15 – 16, 2014, in Lima, Peru. The event will congregate participants from Latin America, Asia and Africa, including indigenous women representatives, activists, researchers, and government officials. The event includes two sections: 1) a workshop to debate and produce recommendations, and 2) a public forum with government officials to present and deliver the recommendations. The International Forum will focus on three topics: a) women’s collective rights to land and territories; b) the integration of women’s perspective in governance of forest and natural resources policies; c) women’s participation in decision-making. The goal of the event is to generate an agenda and recommendations to the Peruvian government and officials attending the UNFCCC – COP 20 regarding the 3 topics (mentioned above) as key strategies in mitigation and adaptation to climate change.